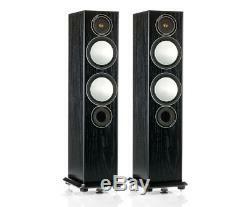 Monitor Audio Silver 6 Black Oak Floorstanding Speaker (Pair). The Monitor Audio Silver 6 following in the footsteps of their RX brethren by offering simply sublime sound from an equally beautifully finished cabinet, whether you opt for the real wood veneer or high gloss lacquer. But this isn simply a small tweek to a already great speaker, the Silver 6 deliver a much more open and expansive soundstage and a level of timing, balance and detail which greatly surpasses that of the previous RX. The Silver 6 incorporates a 6" C-CAM RST bass driver and 6" C-CAM RST bass/mid driver in a 2.5 way system configuration. The drivers are housed in separate acoustic chambers within the enclosure design to provide differential tuning for higher efficiency and enhanced low frequency extension. Excellent dynamics combined with a naturally rhythmic sonic character and tight, controlled bass make the Silver 6 an outstanding communicator of music and film audio in medium to large rooms. C-CAM gold dome tweeter design with damped rear chamber and innovative dome venting technique for improved clarity and wider operating bandwidth. 6" bass and 6" bass/mid-range drivers with concave "dished" C-CAM cone profile for better damping and improved mid-range clarity. Two and a half way configuration with differentially tuned acoustic system for higher efficiency and improved low frequency extension. RST cone profile, for improved diaphragm rigidity and reduced distortion. Cast polymer bass chassis design for better rigidity and reduced reflections. HiVe II port technology delivers smoother airflow for better transient response and tighter bass. Single bolt through driver systems for increased overall bracing, rigidity and driver/baffle de-coupling. Pureflow Silver plated OFC copper internal cabling. High quality crossovers with premium grade polypropylene film capacitors. Available in selected premium quality wood veneers or high gloss finishes. Rigid 20mm MDF construction throughout, employing radial and cross-bracing techniques for high rigidity and low cabinet colouration. Invisible magnetic grille fixing provides clean visual styling when the grille is off. Terminal panel at floor level for easy cable connection. Dual Chamber, Bass reflex with differential tuning. LF: 700Hz MF/HF: 2.7kHz. 1 x 6 RST Bass driver. 1 x 6 RST Bass/Mid driver. 1 x 1 (25mm) C-CAM gold dome tweeter. Cabinet Dimensions (H x W x D) (Excluding Grille, Terminals and Plinth). 885 x 185 x 240 mm (34 13/16 x 7 5/16 x 9 7/16 inch). External Dimensions (Including Terminals) (H x W x D). 885 x 185 x 263 mm (34 13/16 x 7 5/16 x 10 3/8 inch). External Dimensions (Including Grille & Terminals) (H x W x D). 885 x 185 x 275 mm (34 13/16 x 7 5/16 x 10 13/16 inch). (Including Plinth & Feet) (H x W x D) 936 x 245 x 300 mm (36 7/8 x 9 5/8 x 11 13/16 inch). 16.5 Kg (40 lb 8 oz). 3.5mm Jack - Jack Cables. 3.5mm Jack - Phono Cables. Stereo Phono / RCA Cables. Banana Plugs, Spades and Pins. TV Wall Mounts - Flat. TV Wall Mounts - Tilting. TV Wall Mounts - Cantilever. TV Aerial & Sky Accessories. Find out more about our fantastic demo facility. The item "Monitor Audio Silver 6 Black Oak Floorstanding Speaker (Pair)" is in sale since Tuesday, May 1, 2018. This item is in the category "Sound & Vision\Home Audio & HiFi Separates\Speakers & Subwoofers". The seller is "avopro" and is located in BACUP, Lancashire.